With one foot planted firmly out of a plane, your toes curled tightly over the edge of said plane, and that same knee floating freely in the air, you don’t have much choice but to jump. My instructor informed me earlier that day that when you’re more than 10,000 feet in the air and the wind storms loudly in through the open door, “no” sounds strangely like “go.” Perched high above the earth, the word “no” flooded my thoughts and echoed off my skull. Every inch of my body tensed with fear. Standing at the threshold, I couldn’t, for the life of me, remember why I wanted to do this. Mike and I arrived at Pine Hill Airport at noon, ready to skydive for the first time in our lives. It had been my idea — a birthday gift I bought for him that excited me just as much as it did him. We went through an hour of training, where one of the instructors explained to us how you should contort your body for the fall, where your hands should be placed, how far you should arch your back, etc. He took us inside the plane and demonstrated how the jump would occur, though I’m not positive why he bothered. When you’re faced with the actual reality of jumping out of a plane, everything you’ve ever been taught about proper technique quickly flees the scene, leaving you only with an overwhelming feeling of trepidation. Out of everything our instructor told us, the only thing I could remember was the reminder to breathe. That I could do. So as we ascended in the plane, I focused only on inhaling and exhaling and trying not to throw up. 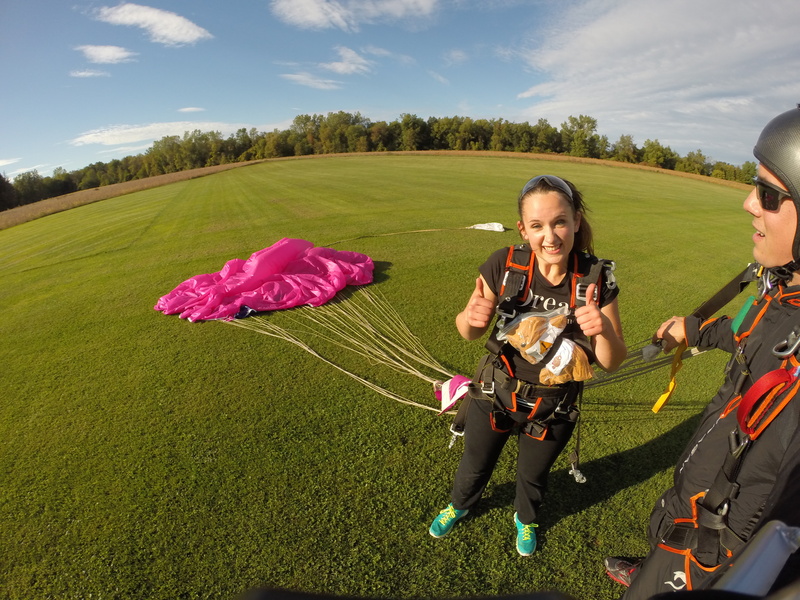 Another instructor, Matt, was chosen to jump tandem with me, and for this, I was grateful. Out of the four of us in the plane: Mike, Matt, me, and Mike’s instructor (whose name I don’t recall), Matt was the only one talking. He talked about himself, asked about us, and did his damnedest to distract us. On the video he shot of us, Mike and I have looks of terror etched into our smiles. At one point, Mike’s instructor exclaimed, “Who the hell would jump out of a perfectly good plane? !” The devious smile on his face revealed his sarcasm, but the statement lightened the mood, though it didn’t manage to diminish our fear. On our stomachs, Mike and I had two bears strapped to us — and no, not for us to hug as we cried on the way down. 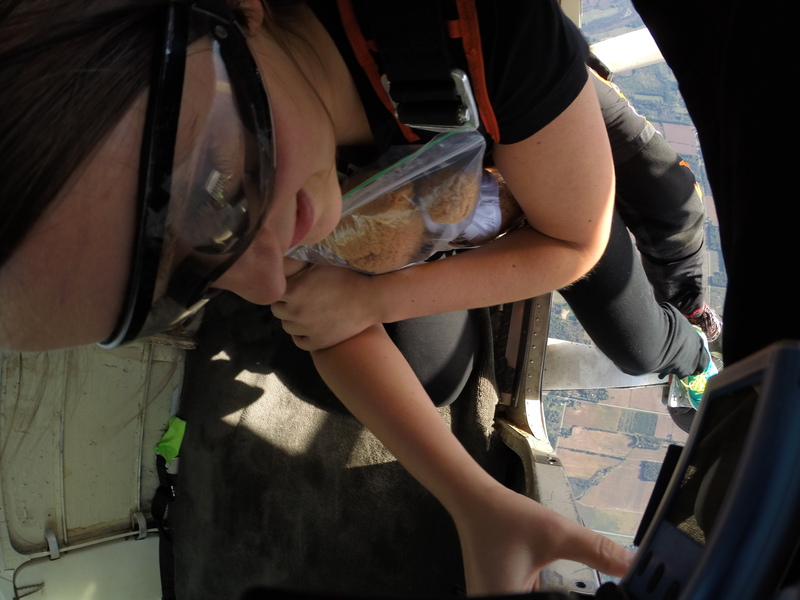 Western New York Skydiving partners with Canopies for Kids, an organization that provides bears to kids in hospitals. The idea is to sponsor a bear with a donation, and then take it with you on your jump. Afterward, each bear is donated to children at Roswell Park Cancer Institute, along with a personalized note from the person who jumped with the bear that explains how the recipient now gets to cuddle with the bravest bear in the world. The goal is to give them a little courage while they are battling their illness, and naturally, I jumped (pun intended) at the opportunity to bring one of these brave bears with me. Back in the days when I had my own teddy bears, I consistently told my parents that one day, I would go skydiving; I would go bungee jumping; I would travel the world; and yes, I would even go backpacking through the Amazon. None of us were quite sure where this sense of adventure stemmed from — perhaps my brother who enjoyed launching dirt bikes high in the air while performing a multitude of tricks and racing his Mustang as quickly as possible down the drag strip without blowing the engine. During those early years, we had been close, and I idolized his need for speed. But skydiving is a different kind of adventure. My brother loved — and still loves — everything fast and powerful, but he has never once expressed a desire to launch himself out of the plane from 10,000 feet in the air or trek through terrain filled with tarantulas and snakes and other deadly beasts. Why these adventures have always appealed to me, I’ve never fully understood. Regardless, I decided it was time to check things off my bucket list. I’d like to make a side note here, just to mention that I fully understand why people hate the concept of a bucket list. Number one, it’s a bit morbid: You create a list of feats you want to accomplish before you kick. the. bucket. The whole paradigm is framed by a person’s imminent death; the idea that you are going to die, and should thus create a list of things you should do before one foot gets sucked into the grave. Horrifying, right? Besides, shouldn’t we all be living our lives with care and caution, thinking about how we want to construction our futures? The answer to that last question is yes. And no. I would argue that we should be consistently thinking about how we want to construct our lives, but maybe not with the care and caution that one would imagine. When you focus only on where you want to be, it detracts from the moment you’re in. This mentality glorifies living for tomorrow. And that is precisely why I love the concept of a bucket list: It is the opposite of this. Given that you actually start checking items off, having a bucket list inspires you to accomplish big ticket items. It encourages you to do the things today that you will be grateful for tomorrow, as opposed to focusing solely on the promise of tomorrow. When you remind yourself that life is short, you unleash a whole new way of living that is much more present-minded. 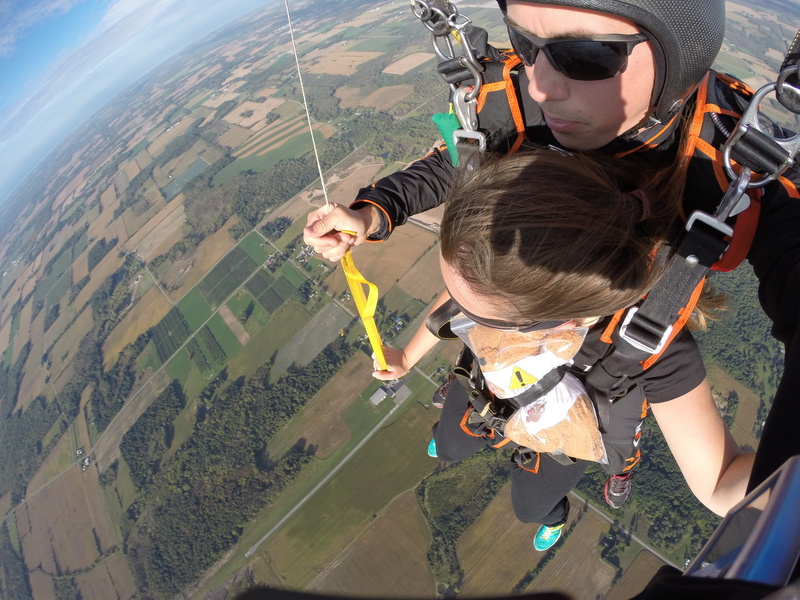 One of my friends from college, Melanie, went skydiving months before I worked up the courage to actually do it myself. She posted pictures online shortly after her experience. As she rapidly fell from the sky, the skin on her face tight against the force of the wind, a wide smile spread across her lips. As I mused about how happy she looked, I came across a picture where she held the palm of her hand out in front of her. Four little words stood out in bold, black ink: Courage to let go. As a mental health counselor, Melanie has seen what stress and anxiety can do to a person. In school, she helped run a club called Active Minds that aimed to break down stereotypes surrounding mental health. She volunteered for the Walk to Save Lives, a fundraiser that raised awareness about suicide and created a forum for survivors to share their stories. So when Melanie wrote, “Courage to let go,” on her hand, it had more depth than just letting go of gravity or letting go of the plane. Melanie’s simple reminder was that letting go of the emotions and fears that paralyze us is one of the most courageous acts that a person can accomplish. Whether it be preconceived notions we have about ourselves that make us insecure, traumatic experiences that have changed us, or mistakes that have haunted us, the most liberating act one can do is to simply let go. Easier said than done, no? For me, losing myself in these huge life experiences is a way of doing just that: letting go. Letting go of stress. Letting go of anxiety. Letting go of poor self-esteem. Letting go of societal standards and norms. Letting go of regrets, what-ifs, the should-ofs, could-ofs, would-ofs. Because when you are crashing to earth at 120 miles per hours, the last thing you’re worried about is how is you look or what people are thinking about you or that time five years ago when you should have said a few words to change a situation. None of that matters when you’re in free fall. Free fall: Noun-The condition of unrestrained motion in a gravitational field; see also: motion. Motion: Noun-An act, process, or instance of changing place. By definition, free falling implies change. You fall from one spot to another, creating motion. What that definition fails to tell you is how liberating movement feels. Once I got over my fear of stepping through the plane’s threshold, I free fell for 36 seconds before Matt pulled the parachute. For 36 seconds, I did backflips and wrestled with a sinking sensation in my stomach that, contrary to popular belief, felt completely liberating. It wasn’t the kind of sinking feeling that comes from being upset or scared, but rather the sensation of butterflies you get before a first kiss or that little flutter in your stomach when you first lay eyes on the Roman baths or the Royal Palace or a beautiful sunset in foreign country. 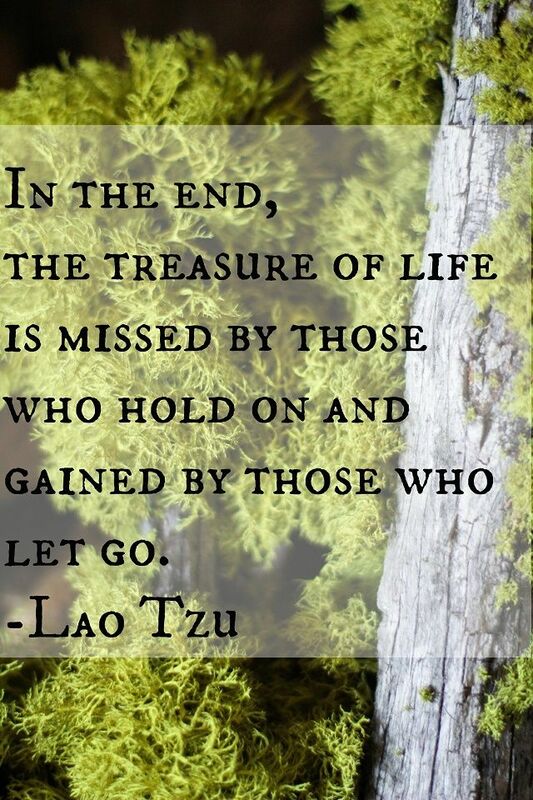 After about 20 seconds, I was allowed to spread my arms wide against the wind, to show my own wise words: Carpe diem, Latin for “Seize the day.” That was my response to “Courage to let go.” Because that’s what letting go is all about: seizing the day. Once our parachute sprung open and we jolted to a slower pace, Matt and I drifted toward earth like the leaves of a dandelion, swaying against the wind. From 6,000 feet, the view is incredible, stretching all the way from Albion, where we departed from, to Niagara Falls and Grand Island. The verdant trees created a thin canopy over countless houses and businesses. Through clusters of clouds, the sun shined dimly over the city, lightly highlighting the skyline. When we extended our legs in front of us for landing and my feet felt the earth once more, I radiated with life in a way that I never had before. I felt alive. Unhindered. Free. And for me, that freedom is worth all the strength it takes to get over my fears and tackle insane feats. So, my question for you, dear readers, is what will you do today that scares you?